How to move to the highest level of performance of integrated delivery through developing a continuum of care, in an effective synergistic care delivery model, which maximizes customer value and addresses proactively the health of populations. Systemness is a term increasingly used to describe the desired future state of complex healthcare delivery systems — delivering patient-focused, seamless and high-quality care across the many parts of the system to maximize value for customers. Some integrated delivery systems are still first generation enterprises (see Figure 1 below) and haven't progressed far in functioning as one with great synergies, while others have begun the journey to third- and fourth-generation organizations. For most organizations, the path to systemness focuses first on assembling the needed system components and rebalancing, as necessary, the system's scope and scale (see Figure 2). Many first- and second-generation systems are still making the shift from a hospital- and ambulatory-centric enterprise to the full, balanced continuum of care. 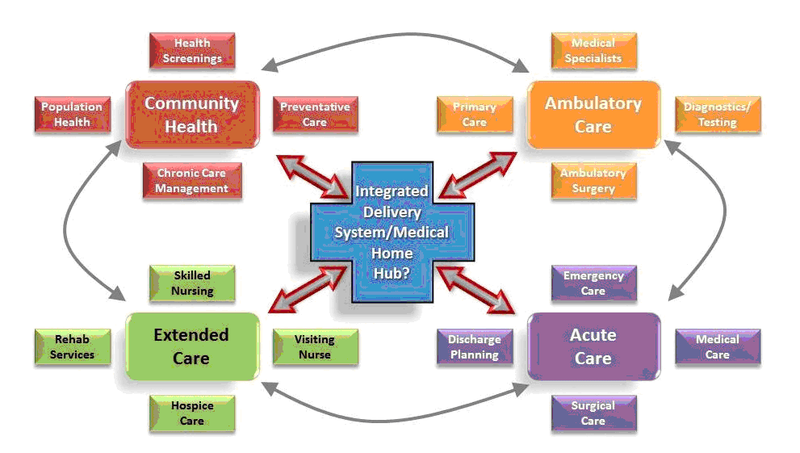 This involves developing, directly or through partnerships, the full and appropriately sized range of extended care and community health resources and starting to integrate them with other system services. It may also involve a rethinking of the integrative mechanisms for care from those that are more virtual to the extensive use of medical homes as an integration hub. As the path to systemness proceeds, the focus is equally on maximizing the effectiveness of clinical operations. This involves optimization of quality/safety and patient satisfaction, initially at the unit/episode-of-care level and then for programs and patient populations. Reducing variation and eliminating waste are key themes during this stage. The migration to systemness moves to a higher level as the focus shifts to value, with cost/price to customer explicitly considered along with the care delivery process, and ultimately the health of populations. 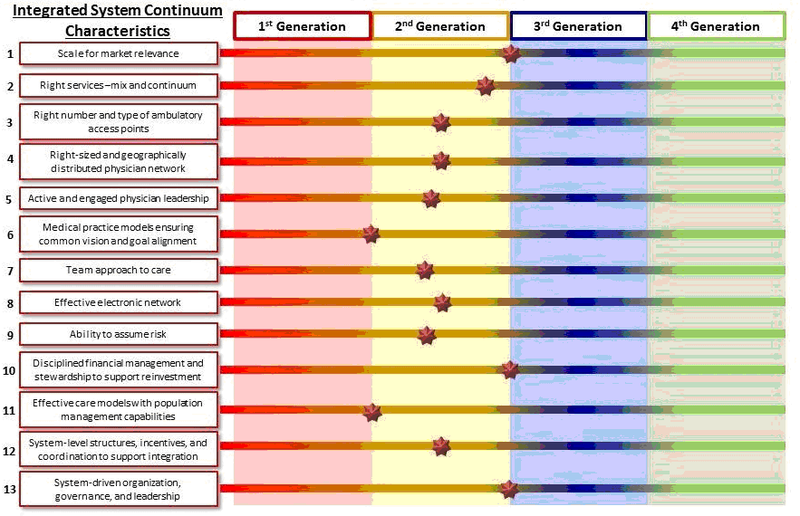 Many of the characteristics involved in creating a high performing integrated delivery system and moving up the continuum from first- to fourth-generation are illustrated in Figure 3. Characteristics 1-4 have largely been addressed above. Characteristics 5-7 deal with the alignment and leadership of physicians and medical practices and the clinical teamwork necessary in advanced care delivery models. This is facilitated by characteristic 8, IT infrastructure, which also helps to support the ability to assume financial risk, advanced financial management and the migration to sophisticated care delivery models. Finally, the last five factors involve required organizational structures, systems and processes to support all of the preceding. Source: Adapted from Daniel K. Zismer, Ph.D., materials prepared for TriHealth, 2010. 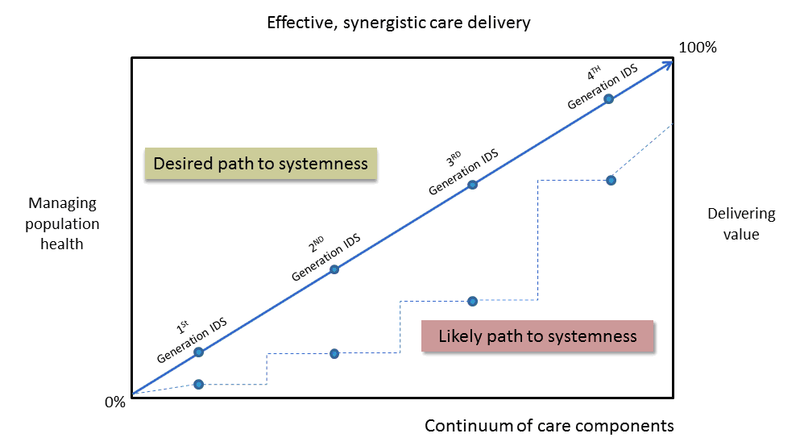 Systemness, and the move to the highest level of performance of integrated delivery, means developing a continuum of care, in an effective synergistic care delivery model, which maximizes customer value and addresses proactively the health of populations. While the path to systemness may vary, the likely path for many organizations and key considerations to progress there, are described above. Alan M. Zuckerman, FACHE, FAAHC, president of Health Strategies & Solutions, Inc., is one of the nation’s leading healthcare strategists and industry thought leaders, having helped many of the top hospitals and health systems in the country develop advanced competitive strategies and pursue merger and affiliation activities. Mr. Zuckerman is highly skilled at identifying how to redesign complex organization structures, align cultures and accelerate organization transformation. A nationally recognized author and speaker, he has written over 75 articles and six books, including "Healthcare Strategic Planning: Approaches for the 21st Century," which won the American College of Healthcare Executives James A. Hamilton Award for healthcare book of the year, and "Leading Your Healthcare Organization through a Merger or Acquisition," published by Health Administration Press in 2010.